My mother and I got into a discussion as to who is supposed to be singing "Danny Boy." I always thought it was a girlfriend, a sweetheart. My mother says it was a mother. She said: "Would a girlfriend call him 'Danny Boy'"? I said, "I don't know, maybe." My mother thought maybe it could even be Danny Boy's grandmother singing the song. Only we could be having this conversation! Here is a "Danny Boy" I love, played by Bill Evans. It has no words so you will not be puzzling over what my mother and I were puzzling over. Above is a great picture I found of an old St. Patrick's Day Parade in Buffalo, on Elk Street, in 1936. I dined out on Elk Street just last week! I had a fish fry. Looking at that photo I think how similar the parade was I saw just the other day. 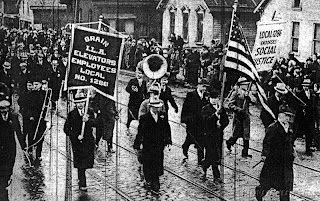 We had the elevator construction union marching just like in the picture. I like the Feast of St. Patrick in part because you know me, I like to celebrate a great feast of the Catholic Church. Also to me it means spring. There was nothing like the sight on Sunday at the St. Patrick's Day Parade of all those shivering girls out there dancing, behaving as if it were summer. My favorite float belonged to, I think, the Woodgate Academy of Irish Dance. All these moppets dancing, and the truck was jouncing up and down. And the truck had a big sign that read: "AND DANCE LIKE THE WAVES OF THE SEA." -- W.B. YEATS. Also the other day I got my annual postcard from the Hotel Lenhart. That is this hotel down near Chautauqua that is like something out of the movies. It is the last great summer resort hotel from the 1880s surviving on Lake Chautauqua. Well, there is one other one and that is the Athanaeum on the grounds of the Chautauqua Institution. 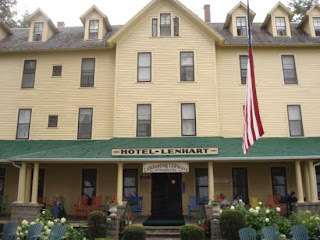 Here is a picture of the Hotel Lenhart. The Hotel Lenhart sends postcards telling you it is opening and then you may make your reservations. However! You can pay only by check, in the mail. No credit cards over the phone. When you get your postcard from the Hotel Lenhart that is how you know summer is on the way. What else? My chives were up in the garden yesterday. The day before that they were not there. Now suddenly they were two inches high. I almost think if I had sat there patiently watching I could have seen them come up out of the ground. I am not sure I want spring because it means boom cars which get in the way of my doing what I like to do, which is sit in the sun room listening to Leonard Pennario. But spring is coming whether I want it to or not. Awesome how that 'Danny Boy' piano went with reading today's blog. Very nice. Thoughts of Spring make me feel better, lol!